Having a baby sets you on a path to a new world centered around worry, safety, and security alongside the emotional overhaul and investment. The struggles of being a new parent are immense, and it is not made any easier by the confusing world of baby related goods. Like other aspects of shopping for a baby, finding and choosing the right baby gate can be a daunting task. So many parents do not know where to start, thus this guide has laid down the basics for you alongside the best products, making it easy to navigate the shopping aisles while embracing the joys of parenthood. There are a number of factors you need to keep in mind before settling on a baby gate. It all comes down to where you intend to put it, the features they have, and your own personal preference in terms of materials and how it operates. The main considerations have been discussed below. The best fit for doorways and hallways are the pressure or hardware mounted Gates that are to be placed on the top of a staircase need to be absolutely safe and secure to reduce the likelihood of any type of accident. In general, the hardware mounted gates are the safest and robust gates, making them the best fit. However, if you choose to opt for the pressure mounted gates recommended for the top of stairs it is best to use them with the supplied wall cups. For spaces over 72 inches, an extra-wide swing gate or step over the gate(hardware mounted if barricading the top of your staircase) is the best fit. If the space is small or congested putting in a swing gate can get in the way. It is better to opt for retractable gates which can roll up like a blind into their housing, out of harm’s way and out of the line of vision. It is important to factor pets in the decision-making process if they are part of the household. 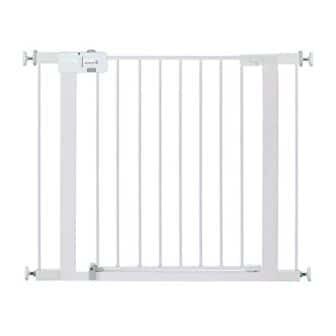 If your pets are too big to squeeze through the bars of a swing gate and too small or unable to jump over it then you should consider a baby gate that is fitted with a pet door. However, pet doors are only available in swing gates. Pressure fit gates and travel barriers are easily portable, and they can be moved easily from room to room or house to house. These gates do not make use of screws so there are no holes in the wall to worry about. However, if you are more inclined towards hardware mounted gates and would like something portable some retractable gates are accompanied with two sets of hardware mounts and are portable. The mounts can be easily affixed and clipped into the spare mounts. Keep in mind that not all gates are intended for use outside. For information on this, check the manufacturer’s blurb. Metal gates that are not protected from outdoor elements can easily rust or fade. At different stages in life, kids come in all shapes and sizes and baby gates are no different. Most gates stand ring in at a 30-inch height but there are plenty of gates on market accommodate taller children. It is important that baby gates should be impossible for a small child to open. However, the parents should be able to open it with ease, and importantly with one hand. Safety and ease of use are the topmost priorities but it will be opaque and in your line of vision at all times for a couple of years, it helps if you like the way it looks too. Baby and stair gates come in a range of colors and materials depending on your needs and taste: metal, wood, mesh, black, white pink. There is a constraint on choice. 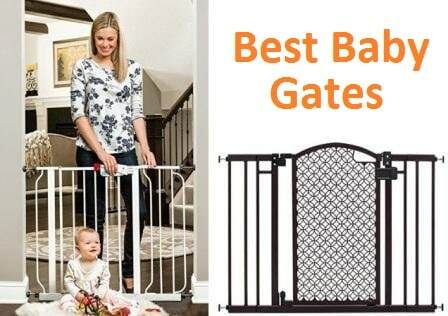 There are a variety of baby gates available on the market, read on to find out which one is the best fit for you. These come in two variations, they can either be pressure fit or hardware mounted. However, if you are choosing to install them on the stairs, the latter is the best choice. Available in both wood or metal, swing gates are the most popular kind on the market. However, they can be inconvenient when they are open, especially is smaller and congested space. If that is a problem, they aren’t the best fit for you. It is advisable to check the width of the doors before you purchase the gate, you may need an extension kit to bridge the gap or rethink the whole set up. Some people opt for a combination of retractable gates and side-opening gates. Swing gates come with hardware mounts which make them perfect for the top of the stairs or pressure fit, which works everywhere. The main advantage of pressure gates is that they do not damage your walls or woodwork. The mechanism of tractable gates is similar to those of roller blinds, the retractable blind part rests in a hardware mounted frame along a hardware mounted frame along a vertical door frame and is unfurled when needed. Since these grates are hardware mounted, they’re a great fit for the top of the stairs. 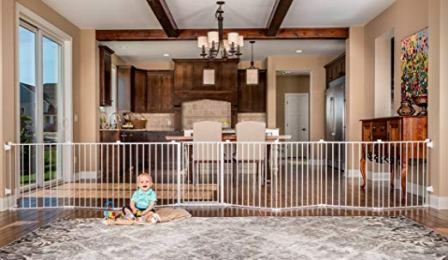 These gates are extremely compact, which makes them perfect if you are short on space and do not want to deal with the hassle of a gate that has to be dealt with every time you go in or out of a room or prefer a baby gate that blends into the door frame when you’re not using it. Retractable gates are easier to operate than swing gates and operate with a push and a rotate action which is easy to work even with a baby in your arms. They are also unobtrusive and stylish. However, retractable gates are more expensive compared to other options on the market. Nevertheless, they are worth the price. Travelling with babies can be extremely hard and stressful especially if the family is living in a house or apartment that is not set up or suitable for little ones. Safety barriers have been designed to offer a solution to roaming movers by providing a portable, temporary barrier from room to room. Travel gates are usually light in weight and collapse which makes them easy to carry around. They are also pressure mounted can easily be adjusted to accommodate a variety of doorways. The barrier can’t be opened per say, the gate is built to be climbed over or it can be collapsed by releasing the pressure lever to remove it completely from the way. However, travel gates are not as strong or robust as permanent options and can’t fare a long term solution and never around stairs. These pressure fit gates are secured in place by the pressure pads placed at either of the four corners on the gate. Pressure fit gates can easily be set up, without any hassle and because they do not make use of any screws, they do not leave behind any holes in the wall. This also makes it easy to be moved around in the house or taken on holiday if weight and size are not a problem. Pressure mounted gatesare designed with a horizontal bar running along the bottom with pressure points located on either side. These make the gate secure but also make them a tripping hazard. This is why it is not recommended to use a pressure gate at the top of the stairs unless they are fitted with wall cups. Pressure gates are extremely easy to set up and throw in the car. Pressure fit gates come in either in metal or wood. They can also be extended if your house has a wide door frame. However, the extension kit needs to be bought separately. 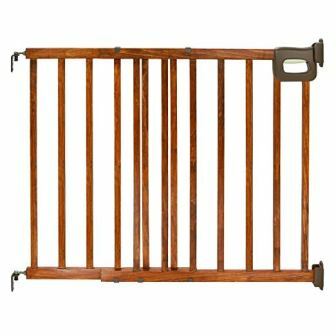 Hardware mounted gates are the strongest baby gates available on the market. These gates are designed to be mounted with hardware and screwed to the door frame. Because these gates are the sturdiest of the lot, they are the perfect fit for the top of the stairs. While it does take some patience and careful measuring to install the baby gate perfectly, it all pays off because the gate gives you peace of mind and no trip bar to worry about, unlike pressure fit gates. Hardware mounted gates are less portable compared to other options because they are screwed into the frame, however, they are the perfect choice if you are looking for a super strong gate that can withstand the pressure and everything a busy family can throw at it. In some cases, swing gates come with quick-release brackets which allow you to can move the gates from room to room. However, to do this extra mounting hardware is required which only some manufacturers will supply. It is best to avoid using pressure-mounted gates the top of stairs because they can easily give way under pressure for example, a child throwing his body against it. At the top of the stairs, use hardware-mounted gates only. It is also best to avoid using old-fashioned accordion-style gates that open to form large diamond-shaped gaps. This is because a child’s head can get stuck in such spaces, which may create a potentially deadly situation. While recent models have a horizontal rail or filler bar across the top of the gate, many reviews on Consumer Report do not recommend them. It is best not to use gates containing areas that can be used as footholds by curious and determined children to climb over. Recently, safety gates have been recalled in recent years for giving way too easily. It is best to check product recalls from the U.S. Consumer Product Safety Commission to make sure the gate you have chosen has not been the target of a recall. Walking is a milestone for every baby. However, once the little ones start walking baby-proofing the whole house is extremely important to avoid any kind of health and safety hazard. This baby gate from Regalo has been designed to provide a versatile way to keep your child safe. Stylish and extremely secure, this baby gate offers numerous convenient configurations for around the house. The Regalo Super Wide play yard and safety gate are characterized by durable all-steel components and a hardware-mount system which is perfect for large, angled or uneven openings. This gate is super wide and can be expanded to fit openings spanning 192 inches. 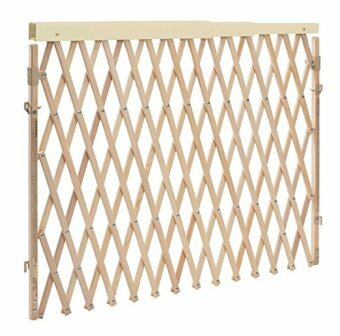 The gate comes with 8 panels spanning 24 inches. The panels connect to hinged post that can be arranged and shaped in a variety of different ways. The gate can be easily mounted to the wall and also features a convenient walk-through door which comes with a double lock lever handle which is child proof but allows adults to easily pass through. The gate is ideal as a play yard, a fireplace barrier, a blockage at the top of the stair or as a gate for very wide openings. The Regalo Super Wide comes in the color white. The wall mounting brackets that accompany the gate add 2” to each side, 4” in total. The door stands at 28 inches. This gate has a convenient walk-through design featuring an easy one-touch safety lock release lever. The gate is extremely easy to assemble and take down. Featuring a sturdy all-metal frame, the gate can be configured easily for multiple uses. 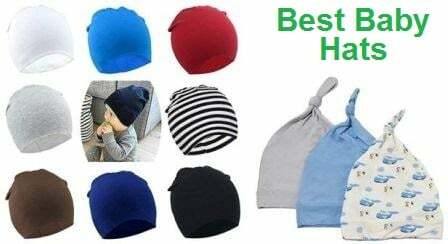 It is perfect for children up to 6-24 months. This baby gate has a number of attractive features. It is easily removable which makes it easy to clear a walkway temporarily if it has to be used for something else. The gate can also fully swing to either side or completely detach from the hardware making it easy to store and reassemble. The gate can also expand up to 13 feet. The gate comes with an available 15-inch extension, you can add up to 6 panels total to expand the gate an additional 7.5 feet, allowing for up to 13 feet in gate width. The gate also comes with a hold open feature which looks the swing gate in an open position allowing you to go back and forth between rooms without having to open the gate repeatedly. The gate is also suitable for a one-hand operation which is often the case with mums, allowing you to run from one room to the other without any hassle. It comes equipped with a double-locking feature, so you know your child is always safe. This play space is made for both, indoor and outdoor use. It embodies versatility in 18.5 square feet of space, allowing your child to engage in hours of safe, secure and enclose fun. The product is easy to set up, simply requiring assembly. This model from Regalo has the highest number of positive reviews on Amazon. This model packs safety and security into a neutrally toned model that will fit any type of décor. It is extra wide, expanding to stairways and openings between 29-38.5 inches wide. It also rings in at 30 inches in height. However, it is important to note that the gate will not fit an opening between 34-35 inches. To fit, it will need an extra 4-inch extension which is sold separately. The gate is also adjustable, it includes a 6-inch wide extension kit making it perfect for a variety of openings ranging from doorway, hallway, and bottom of stair use. The gate is also portable and easily removable, it can quickly be removed out of the opening for easy storage. With additional extensions at max, the gate can accommodate a 60-inch opening. It also contains a safety-lock feature and wall mounts for added security. The main body of the gate is made up of an all steel body which lends it durability and strength to withstand pressures. The product comes with a 6-inch extension kit in case there are any needs for adjustments. It also includes 4 pressure mounting spindle rods as well as wall cups for additional security and reinforcement. The instruction manual is easy to follow and the gate can be assembled quickly. It also comes with a swinging door which is easy to maneuver, making trips from one room to the other hassle-free. The gate is the perfect fit for children 6-24 months, it is also great for pets. 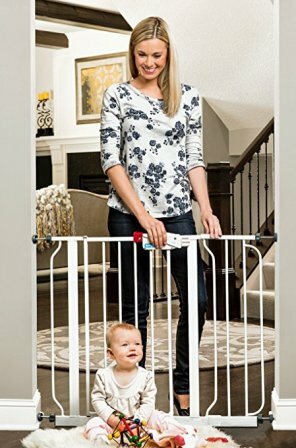 The Easy Close Safety Gate by Munchkin has a number of valuable features. This versatile model comes in an easy-to-open package and features a simple locking mechanism, which saves you the hassle as there is no fiddling required. This easy to lock gate simply requires you to release the handle with a firm push and the gate will lock shut. For additional security, the gate also features two extra bottom locks which allow for greater control over how and when the gate opens, lending you better peace of mind. The gate features a dual locking system, including a child-proof lock that can easily be opened by adults but not by children. This gate is perfect for a variety of places ranging from use in doorways, stairways to halls. The gate can be mounted using hardware or pressure mounts. This easy-to-use child gate is tall, ringing in at 29.5″ tall has an adjustable width spanning between 29.5″ to 35.0″ wide. Once the baby starts standing on its own legs and running around the house, baby-proofing the house becomes extremely important to avoid any kind of health and safety hazard. This product from Regalo has been manufactured to make your life easier and transform your house into a safe zone for your little ones to grow up in. The Regalo Easy Step Extra Tall Walk-Thru Gate has a number of excellent features. It is easy to assemble, with easy to follow instructions and pressure mounts which simply require a screwdriver and a couple of minutes out of your day to install. The door also has a walk-through design features which allow you to walk from one room to the other easily. It also has a one-touch safety lock which allows one-handed operations which are usually the order of the day. The gate also comes with a 6-inch long extension increases the gate length from 29 to 37.5-inches wide if needed. Moreover, the gates are extremely light in weight and feature portable construction that can be stored flat without taking up much space. The gates are easily removable and transportable. This product from Regalo features all-steel construction and which has been certified by the Juvenile Products Manufacturer’s Association (JPMA) for strength and safety. The gate is extra tall and has been engineered keeping mind ease of use, ease of installing and removing it in a couple of minutes. The package comes with all four pressure mounts which can easily be adjusted for the perfect fit regardless of where you choose to set it up. The step-through design is perfect for checking in on your baby at various times throughout the day. It also provides ease of access between the two spaces. The gate stands at 41 inches tall, making it a hard climb and you can be sure that this gate will keep your curious, adventurous little ones safe from harm. The gate is easy to take care of and maintain. It is ideal to avoid using abrasive cleaners or bleach. It can be cleaned by sponging with warm water and a mild detergent. It is also recommended to check for signs of damage, wear, or missing components from time to time. It is best to not use if any part is missing, worn or damaged. Once the baby starts standing on its own legs and running around the house, baby-proofing the house becomes extremely important to avoid any kind of health and safety hazard. Childproof your home in effortless style with this Multi-Use Deco Extra Tall Walk-Thru Gate from Summer Infant. This attractive metal gate is adjustable to accommodate most door openings and stairways. This product boasts a number of key features. Made for use in between rooms and on stairways, this versatile gate can be used to keep your child in a safe and secure location while you carry on with your household chores. The gate rings in at 36 inches tall, making it perfect for a home with feisty toddlers. It can be set up using either pressure mounts or hardware mounts. The gate is perfect to put in position between doorways using pressure mounted tension bolts. Pressure mounts are great because they do not require any kind of drilling or additional tools thus helping prevent marks, dents, or scratches on walls. Hardware mount, on the other hand, is optional with this gate to reinforce the installation. Mounting with hardware and the door stopper makes the gate perfect for use at the top or bottom of the stairs. However, tools are required for hardware mounting. In addition, the gate features a one-hand walk thru operation. When it is installed between rooms, the gate door opens in either direction and can be operated with just one hand. In the stairway, however, the included door stopper adds security, preventing the door from swinging open over the stairs. In addition, the gate features a dual locking system which provides peace of mind, so you know your gate is securely locked every time! The gate also makes use of a convenient auto-close system. When walking through the door, it will gently close behind you. The size of the gate is fairly large, the gate is 36” tall gate and it can fit openings between 28.5” – 48” wide. The gate has a sturdy and resilient body with a bronze finishing. The gate is perfect for use for kids between 6-2 years of age. 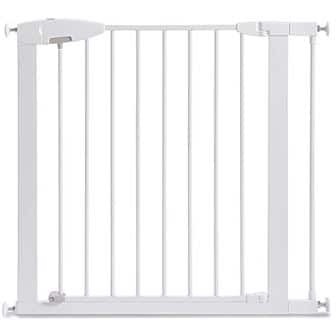 This gate from Regalo is extremely easy to use. It has been designed with a walk-through door and has been equipped with a safety locking feature, providing you peace of mind that it will swing shut behind you. Moreover, the gate is easily configurable and can be molded according to your requirements. Each panel on the gate can be adjusted to fit almost any opening. This makes the gate the perfect fit for a variety of areas ranging from wide spaces, angled openings, hallway, doorway or bottom of stairs. The door can also be packed away easily as it folds flat for storage. The gate keeps safety at the forefront, it is wall mounted for added security and protection. The gate has been made to meet all current safety standards. 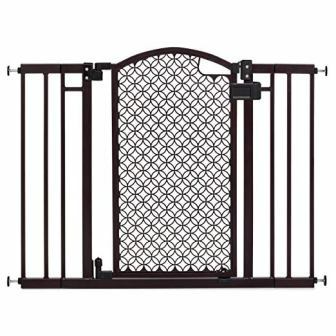 This gate from Regalo features an all-steel construction which has been certified by the Juvenile Products Manufacturer’s Association (JPMA) for strength and safety. The gate is also extremely easy to assemble as it requires only the use of a screwdriver and a few minutes out of your day o install. This product from Regal also has a walk-through design feature that allows you to conveniently walk between rooms. Moreover, the gate also features a simple lever-style handle with a sliding release safety lock for added ease and accessibility. In addition, the gate is also light in weight and features a portable construction. The gate opens up to 76 inches wide and stands 31 inches tall. It is perfect for use for children between 6-24 months of age. Once the baby starts standing on its own legs and running around the house, baby-proofing the house becomes extremely important to avoid any kind of health and safety hazard. Childproof your home in effortless style with this Modern Home Decorative Walk-Thru Baby Gate from Summer Infant. This attractive metal gate is adjustable to accommodate most door openings and stairways. Made for use in between rooms and on stairways, this versatile gate can be used to keep your child in a safe and secure location while you carry on with your household chores. This product has a number of key features. It has been designed with a walk-through door and has been equipped with a safety locking feature, providing you peace of mind that it will swing shut behind you. It can be set up using either pressure mounts or hardware mounts. The gate is perfect to position between doorways using pressure mounted tension bolts. Pressure mounts are great because they do not require any kind of drilling or additional tools thus helping prevent marks, dents, or scratches on walls. Hardware mount, on the other hand, is optional with this gate to reinforce the installation. Mounting with hardware and the door stopper makes the gate perfect for use at the top or bottom of the stairs. The assembled dimensions of the gate ring in at 28″ to 42″ (71 cm to 107 cm) in width and height 30″ (76 cm) in height. The gate stands tall at 30 inches, keeping curious children out of the zone. It also features auto-close & hold-open which make maneuvering the gate very easy. The gate features sturdy and durable construction with a decoratively arched doorway finished off with a bronze look. The final package includes (2) 5 extension frames. The included pressure mount is for use in-between rooms and doorways. There is a hardware kit included for use at top of the stairway. Walking is a milestone for every baby. However, once the little ones start walking baby-proofing the whole house is extremely important to avoid any kind of health and safety hazard. This baby gate from Cumbor has been designed to provide a versatile way to keep your child safe. Stylish and extremely secure, this baby gate offers numerous convenient configurations for around the house. This gate from Cumbor is tall and wide, perfect for enclosing large space. It rings in at 30.5″ in height and fits 29.5-38.5″ in width. This gate also features an extremely durable design. It is sturdy and resilient so much so that it can defend a maximum of 200-pound impact by Huskies and Alaska. Moreover, this gate also features a small gate for cats to walk through, however, it does not accommodate larger animals like dogs. The gate is safe for babies as the double-touch release safety lock is difficult for toddlers to open by imitating. The gate also features auto close features which make it close on its own due to gravity (angle over 90° will keep opening). The gate is extremely easy to install. It requires the use of simple pressure mounts that enable the door to swing in both directions. It is perfect for hallways, doorways, stairs, open spaces, and bottoms of stairs. Your wall will also remain protected, the hardware mounting and 4 cups are included for this purpose. Once the baby starts standing on its own legs and running around the house, baby-proofing the house becomes extremely important to avoid any kind of health and safety hazard. 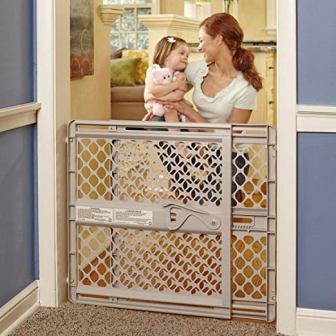 Childproof your home in effortless style with this Safety 1st Easy Install Metal Baby Gate. This attractive metal gate is adjustable to accommodate most door openings and stairways. This gate has a number of key features. It has a customizable width; the safety gate adjusts to fit wide doorways and openings up to 29 and 38 inches wide and is 28 inches high. This gate lends an extreme sense of safety and security to the zone which is amplified by the presence of an easy-read indicator. When the gate needs to be readjusted and secured, the indicator turns red. It also features a simple one hand release, adults can maneuver the gate using on hand, while the two action handle is a bit tough for youngsters to release and open. Moreover, the gate is extremely easy to install, requiring you to follow simple instructions on the manual. The gate can be installed in two ways, it can be pressure mounted and hardware mounted. If you choose to opt for the hardware mount, it is ideal to install it at the top of the stairs, make sure it swings to the landing and not over the stairs. The pressure mount should be used where falling is not a hazard. Moreover, the pressure mount avoids damaging the walls. The package includes two extensions. Learning to walk is a key stage for every baby. However, once the little ones start walking baby-proofing the whole house is extremely important to avoid any kind of health and safety hazard. This baby gate from Summer Infant has been designed to provide a stylish way to keep your child safe. This gate is extremely stylish and unique, featuring a one-hand walk thru operation. When it is installed between rooms, the gate door opens in either direction and can be operated with just one hand. 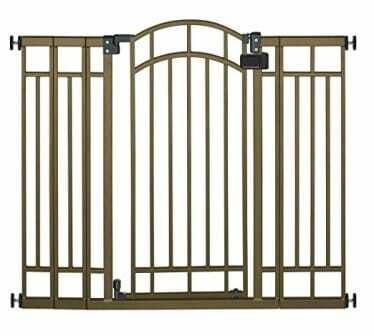 Moreover, this model is a hardware mounted gate includes Summer Infant’s unique Precision Fit template which makes installation easy and flawless. In addition, the gate features a dual locking system which provides peace of mind, so you know your gate is securely locked every time! The gate also makes use of a convenient auto-close system. When walking through the door, it will gently close behind you. The gate can accommodate openings up to 30-48 inches wide and stands 32 inches tall. The gate has an Antique Oak finishing. The age range for the gate is between 6 months and 2 years. Once the baby starts running around the house, baby-proofing the house becomes extremely important to avoid any kind of safety hazard. Childproof your home in effortless style with this Regalo Easy Open Extra Wide Gate. This attractive metal gate is adjustable to accommodate most door openings and stairways. This gate is extra wide, it stands 30 inches tall and can be set up to fit openings between 29-47 inches wide. It is also easy to use; the pressure mount design is very easy to set up and does not cause any damage to the walls. It is also adjustable; the gate comes with 4-inch and 12-inch wide extension kits. The gate can be used in various places such as doorways, hallways, and bottom of stair use. It can also be easily stored. The all-steel design is durable and convenient, featuring a walk-thru door design for easy navigation from room to room. It also supports one-handed operation with its easy one-hand open handle. 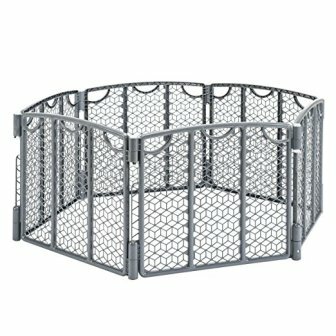 This main body of this baby gate is made of all-steel construction. It fulfills the need of parents for a sturdy gate, that can withstand pressure from babies and animals alike. In addition to making the installation process extremely easy, the four pressure mounts that are included can be modified and adjusted to create a stable and secure fit. If you prefer attaching it to the wall, the included wall cups can be used. Walking is a milestone for every baby. However, once the little ones start walking baby-proofing the whole house is extremely important to avoid any kind of health and safety hazard. This baby gate from Evenflo has been designed to provide a versatile way to keep your child safe. The gate is extra wide; thus, it is suitable for a variety of opening in the house ranging from hallways to doorways. The extra wide width means that the gate can fit openings up to 24-60 inches. Moreover, it is the perfect fit for high traffic areas, allowing for a quick and easy pass through. The gate features a four-point hardware mounting that can easily be installed. This expansion swing wide gate can keep children safe and secure in play zones while you carry out your household chores. Learning to walk is a key stage for every baby. However, once the little ones start walking baby-proofing the whole house is extremely important to avoid any kind of health and safety hazard. 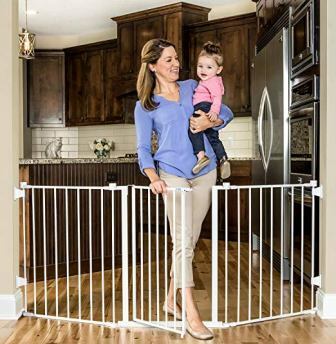 This baby gate from North State has been designed to provide a stylish way to keep your child safe. The gate provides safety and security for children while giving you peace of mind. It has been designed to be difficult for kids or pets to climb and securely blocks doorways, stairways, and other spaces. It is also easy and convenient to install, as it can be set up right out of the box. It makes use of pressure mounts which require no measuring or tools and is easy on walls. The gate is also durable and secure, it comes with door sockets which reinforce pressure mounting in wide openings. The gate is tall, which adds security. It can also be used as a swing gate, all the material needed to do so is included. Starting a new venture into parenthood is daunting in itself. Having a new baby to take care of is scary as each stage of their growth brings new trials tribulations. When they begin to walk, they need to be confined to a safe and secure zone to avoid any kind of accidents or mishaps. Among the many tools to create safe spaces, one of the most important ones are baby gates. Because they are so important, it is essential to understand the basics of baby gates, their types, used and other intricacies surrounding their purchase. This guide is designed is to outline the very basics, providing the reader with the essential information needed to make the perfect decision.